Food lovers rejoice – cooking gourmet meals at home just got a whole lot simpler. 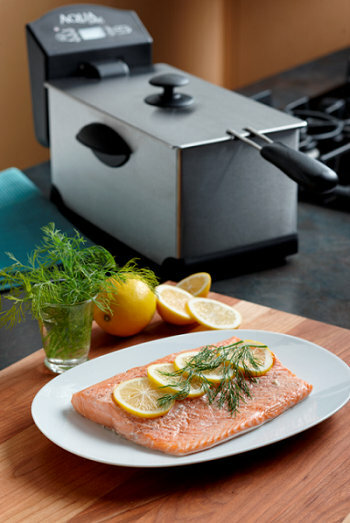 The creators of the AquaChef Sous Vide Smart Cooker make it easy and affordable to serve delicious, flavorful, upscale recipes like this Simple Lemon-Herb Salmon. Ideal for home cooks of any skill level, the AquaChef is one of the most versatile compact kitchen appliances available. By cooking food in a temperature controlled water bath, heat transfers better than in traditional ovens, resulting in food that is evenly cooked all the way through. Plus, since food is cooked in a vacuum-sealed bag, the natural flavors, nutrients and moisture are locked in for healthy dishes free of added fats. This revolutionary cooking method eliminates the guesswork and hassle of preparing meals at home – anyone can create mouthwatering dishes with unmatched taste and texture. From juicy, rare beef to succulent pork tenderloins, even silky custards – the possibilities are endless. Seal: Vacuum seal salmon, lemon and dill in bag. Set: Select required end temperature and place bag in the water. Serve: Remove perfectly cooked salmon from bag and serve. Complete the meal with a fresh green salad and crusty bread. This simple yet impressive salmon is ideal for dinner parties, holidays, or even to surprise the family with a special weeknight meal. Simply seal, set and serve. Remove basket. Add water to reach maximum fill line. Plug in appliance; turn on. Set temperature to 126°F and press start button to preheat water. Water will be preheated when indicator light changes from red to blue. Salt and pepper salmon to taste on both sides. Arrange lemon slices and 2 to 3 dill sprigs on flesh side of fillet. Place fillet in vacuum seal bag, skin side down. Seal bag; vacuum out as much air as possible. When water is preheated, set cook time to 45 minutes. Place vacuum-sealed salmon in cooking basket and lower it carefully into water; cover. When appliance beeps, carefully remove basket (it will be hot). Remove salmon from bag; serve immediately.